The third stop for Fashion Week Spring Summer 2019 is Italy’s fashion capital Milan. We cover the best looks from Fendi to Versace and decode what we will be wearing next according to Italy’s finest designers. Let’s start with the most fun fashion house, collection and above all runway show, not only of Italy, but of all fashion weeks combined. I can never wait to see what Jeremy Scott’s new collection for Moschino will be. 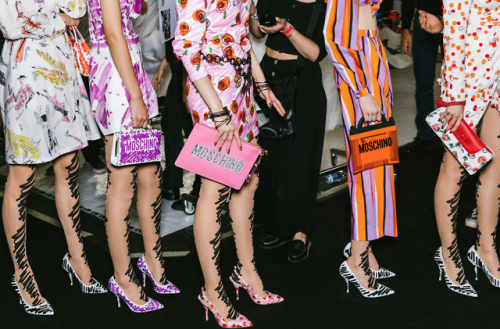 For the Moschino SS19 collection, Jeremy Scott was forcingly ‘inspired’ by the fast fashion system that designers have to keep up with. With two main collections, pre-collections and collaborations ‘it just feels like a never-ending Fashion Week’, he explained. The fast-paced fashion industry left him with nothing more than sketches at the time of the deadline. 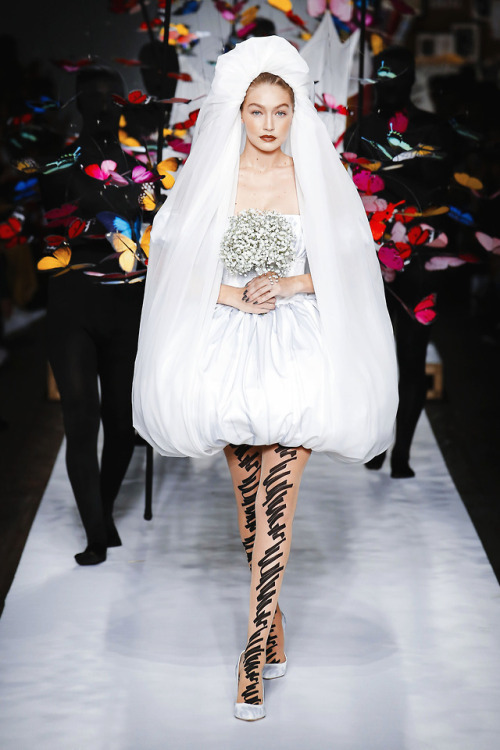 But Jeremy Scott wouldn’t be Moschino’s fashion rebel designer if he did not turn this into genius creations. 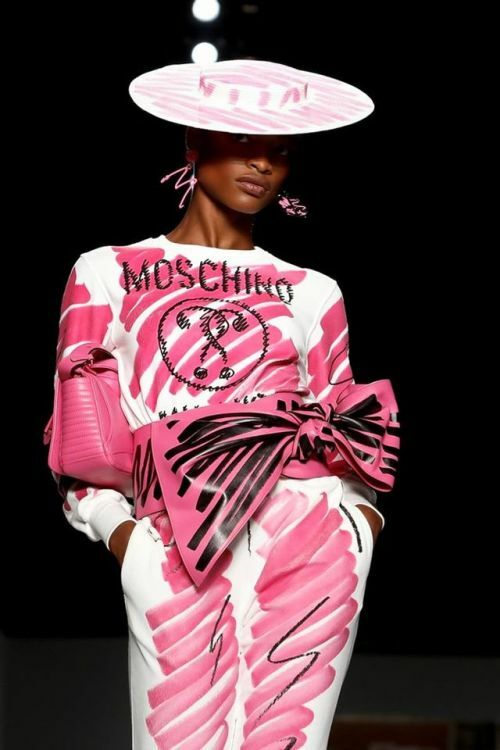 So, the Moschino SS19 fashion show is all about the creative process of the designer. The designer’s sketches came to life on the runway. The fashion house with the most feminine collections reinvents itself every year but holds on to the formula of success. Why change a winning team after all? This season Dolce & Gabbana’s SS19 collection holds on to its signature Italian Romanticism. The all-black lace ensembles we saw former seasons, also make an appearance on the runway this season. But we also spot a broader color palette of white, beige and pastel blue. Red roses and golden crowns finish the romantic and dramatic theme. 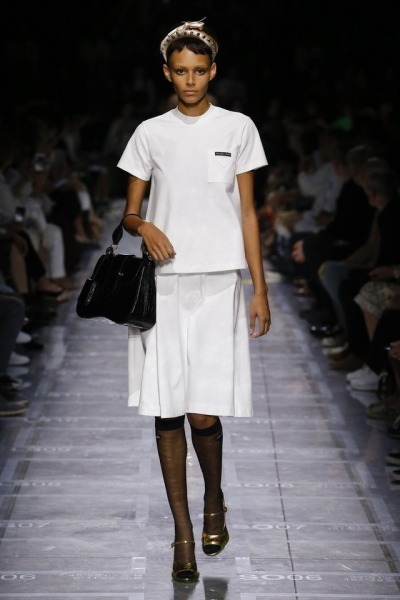 The color palette was not the only thing that was broad on the Dolce Runway. 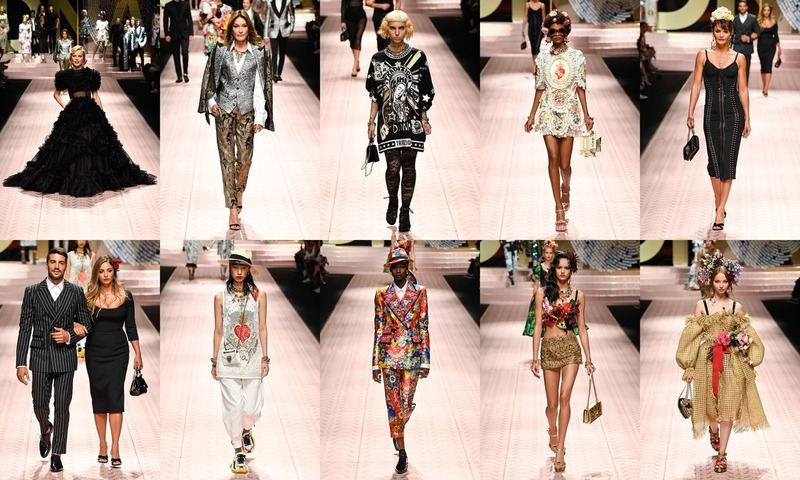 The Dolce & Gabbana SS19 Fashionshow was a theatre with the Italian village functioning as scenery and supermodels, influencers and the 90s supers – yes – in the lead. The show made clear that great Italian style is for all ages, as there were babies and grandmothers joining the Dolce & Gabbana runway family. Ringing church bells introduced the Italian church theme and introduced its first guests: Monica Bellucci, Eva Herzigova, Carla Bruni, Helena Christensen and Karen Elson. Let’s see how the Italian’s go to church the Dolce way. 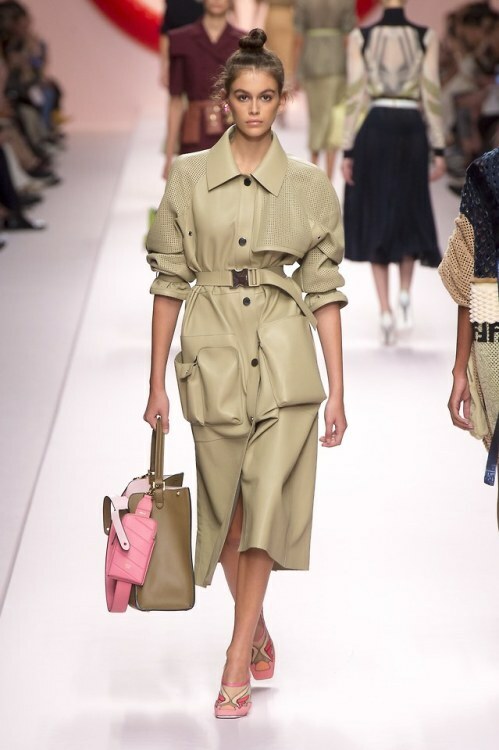 Fendi’s SS19 collection stole the show with its amazing color palette of brown, beige, orange, deep purple and pastel green. 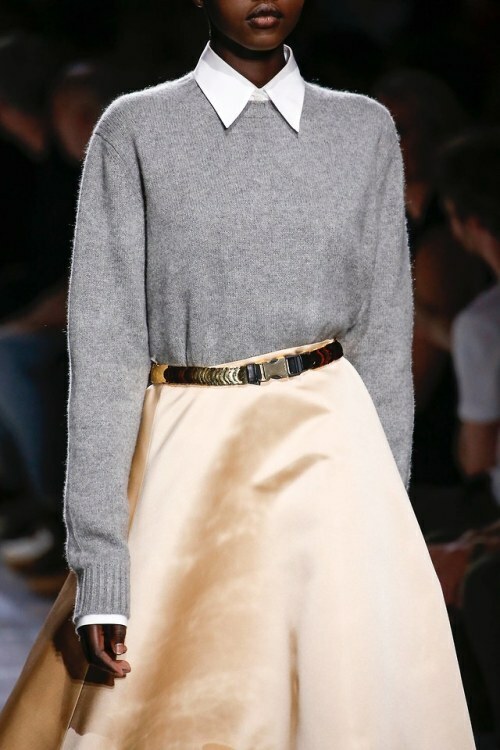 Karl Lagerfeld himself titled the color theme ‘off-brown’. 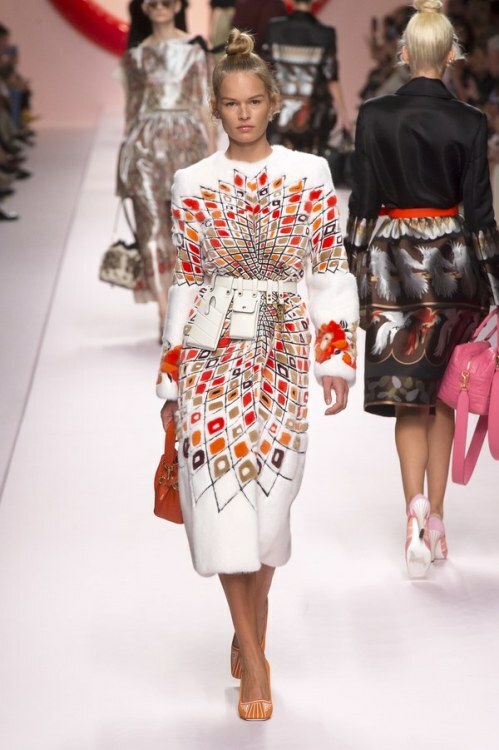 The previous Fendi collections of logomania provoced exactly that into street style globally: logomania. Making Fendi one of the most popular designers worn by street style fans. The SS19 collection had a less prominent place for the Fendi logo. This collection showed new street style inspiration in the form of fake fur, plastic and brown leather. Karl Lagerfeld must have had the current rave for urban wear in his mind when creating this collection that is clearly geared towards the daily, casual items with an infusion of sportswear. All finished with an impeccable eye for luxury and details, of course. 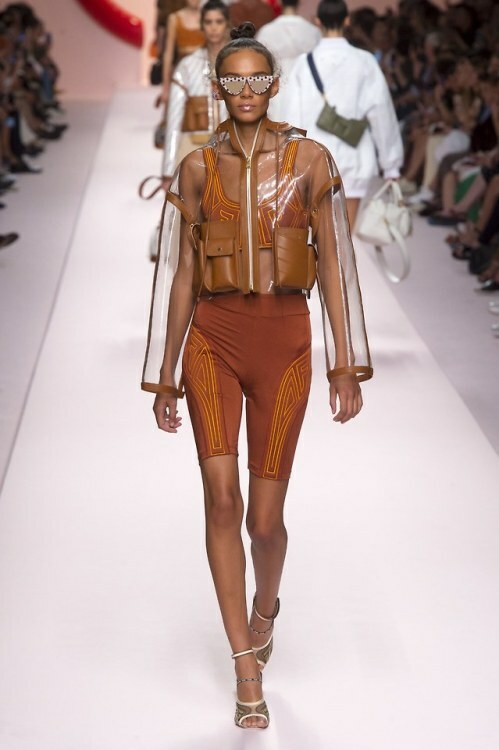 Fashion notes to put on our wishlist are cycling pants, plastic, leather, oversized pockets, architectural capes, baseball jackets and belted bags. 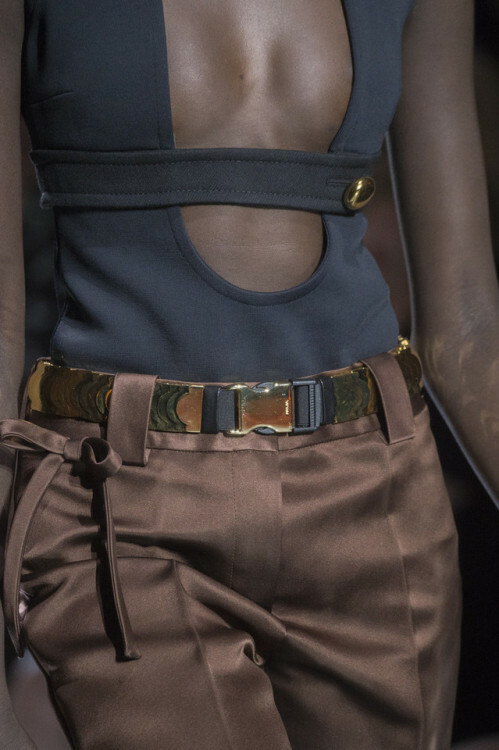 Versace’s SS19 collection was full of retro references. And Donatella Versace didn’t pick one decade to be the source of inspiration for her most recent fashionshow. She took the best of all with sixties jackets, seventies hippie florals, eighties disco party dresses and nineties platform trainers. What to take from the Versace show? Floral bedazzled side hair clips, satin red coats, and all that is heeled: strappy sandals, chunky trainers, sling backs and vinyl boots. Miuccia Prada was searching to express what is happening in the world right now. Which is exactly the place where fashion clashes into commercialism. Fashion designers are artists expressing their creativity but have to be relatable for the broader audience with a commercial end goal in mind. Her collection is searching for opposites within society. She explains her quest for societal codes by breaking the rules. This resulted in sweet-girl sixty headbands on every model paired with lady-meets-tramp white mary jane’s.